Every room holds a new mystery—from the subterranean mines to the forbidden attic—from the library of secrets to the cage-like elevator with a mind of its own. The house is designed like a butterfly killing jar…designed to allure and trap the beautiful and the innocent. It also hides the Sharpe family’s darkest secrets and reveals unspeakable truths. Indeed, who will make it out alive? The haunted house that is Allerdale Hall is perhaps the most important element of the film and acts as a vessel for the storyline. It is the story’s most fearful character, oozing red clay from beneath the earth. Del Toro is an artist who visualizes before he builds, so it’s no surprise that once he had assembled a team to make his visions a reality, the house and all of the elements it embodies already existed in his mind. The house was a character with its own biography and history. No existing structure could satisfy del Toro’s vivid imagination. Where other Hollywood productions would have turned to computer technology, creating an edifice filled with fears and terrors, the director decided to build a magnificent set of days gone by. Building the haunted house required teams of set designers, builders and decorators to work in tandem for nearly six months in order for everything to be completed in time for the shoot. Naturally, designing to facilitate the work of cinematographer Dan Lausten was a key part of every conversation. Every production begins with a given set of constraints, schedules, budgets and approvals. For art director Brandt Gordon, those pressures were a daily negotiation in order to make all the visual elements of the film a reality. The collaboration began at script level. From the very first read, he began working alongside production designer Thomas Sanders, set decorator Shane Vieau and costume designer Kate Hawley. Together, the team would research, compile design elements, palettes, textures and shapes and present them to del Toro for review. The director instantly filtered what worked and what didn’t. From del Toro’s mandates of “We want square shapes in US and round shapes in U.K.,” each decision from the director helped to inform the team’s design choices and create the two distinctly different worlds that del Toro had envisioned. Twelve weeks before pre-production began, production designer Sanders arrived in Toronto with a 20-foot trailer, ready to create a shop and build models. Sanders’ process is unique; no one in the industry builds models of his scope. His method, what Gordon refers to as “3D sketching,” was instrumental in determining all the features of the final set design—including proportions, wild walls, layouts, colors and finishes. It was not a traditional art department in the beginning, but to accommodate Sanders’ process Gordon hired a support team—key scenic artists Cameron Brooke and Robert Brooke—as the model building began. Working on this level allowed the team to smooth out design problems and develop concepts more efficiently. Morning meetings included illustrator Guy Davis, who would make 2D sketches for the model building team. 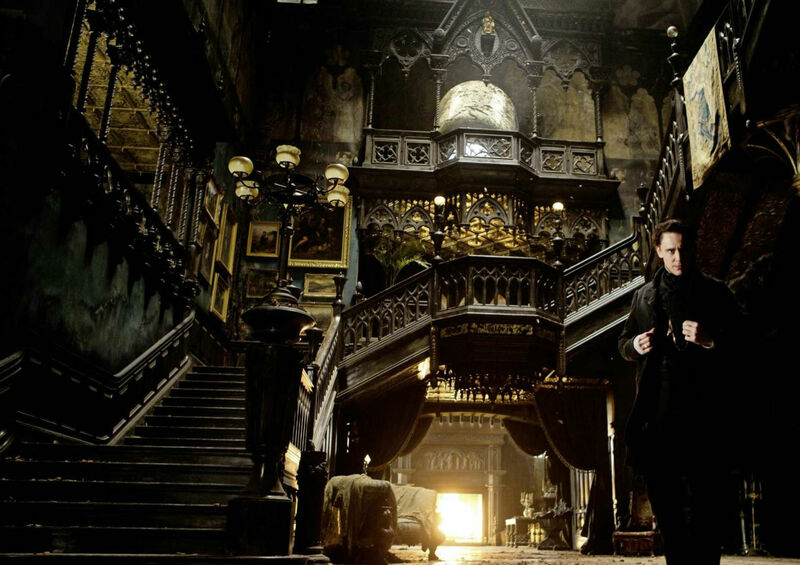 Del Toro sifted through all the ideas on the table to create a design palette that Gordon describes as neo-Gothic, with Tudor influences and neo-Renaissance influences. As the model building progressed, the director was also able to figure out camera angles and plan his shots, well before the set ever existed. Brooke was instructed by Sanders to add magnets to pieces of the model so that it could be easily taken apart and put back together. Initially, del Toro was a little hesitant about the maquette, but quickly realized that Sanders created a working sketch that could change with the director’s needs and demands. Del Toro was instrumental in informing the feel and palette of the house, providing the team with references to previous films he had worked on, as well as numerous books and other source materials. For the clay mine, says Gordon, “He brought out a Japanese book with imagery of pools of rusty water; there was a teal-green color to the walls.” Del Toro had specific ideas about the characters painted on the walls, what the columns should look like, how aged the décor should look and how to give the sense that it was once a very elaborate and expensive place. A team of sculptors created clay models of architectural pieces from the period that would be impractical (and virtually impossible) to purchase. The clay models would then be made into molds, and the pieces were reproduced in the quantities needed. The full-scale production team was upwards of 120 people and, at any one time, approximately 60 were working in the mold-making department—from the sculptors and plasterers to the people making the silicone to those creating the jackets. Allerdale Hall was no ordinary set; it was a house complete with ceilings and hallways connecting all the rooms, the equivalent of 10 sets in one. The idea was that the seamless set would allow the camera to move from one part of the house to the next without the need for digitally stitching scenes in postproduction. To allow for larger spans and give del Toro’s crew more flexibility to decide where the massive walls should be as things developed, large parts of the set were built of steel rather than traditional wood. In fact, all the fireplaces on the set were functioning, so everything had to be fireproofed. The floors had a very specific wood look, but were made of a very strong type of concrete to stand up to crew traffic without being damaged. The design elements also included moths, which the director wanted to incorporate throughout the house. According to the writer/director, “this house has to be alive.” Sanders suggested that the wall surfaces were the skin of the house, and the cracks were revealing the flesh. “Yes, the house will be oozing its bodily fluids,” del Toro laughs. Gordon’s team was also involved in the practical special effects, making clay bleed from the floor and walls. They determined the right material to achieve the viscosity, the color and the look. The effects contributed to character of the house, an edifice that was living, breathing, bleeding. Finding practical locations was another logistical challenge that required not only period appropriate interiors, but also the flexibility to transform them to suit the style of the film. One of these was Victoria College in Toronto. Gordon had night crews working 14-hour shifts for weeks to prep and paint the locations. Once the school opened again they could only return on the weekends. In other cases the difficulties were created by nature. In mid-February, when the team began to work outdoors to set up the main façade of Allerdale Hall, the Canadian ground was completely frozen. When shooting began in April, everything began to thaw. “We experienced the whole freeze-thaw cycle—being up to our knees in mud as we were getting the final elements ready for the shoot,” says Gordon. It then took almost three weeks to transport everything back to the stage, and another week to dress it with white and red snow; to accomplish, the scenic team used paraffin wax. 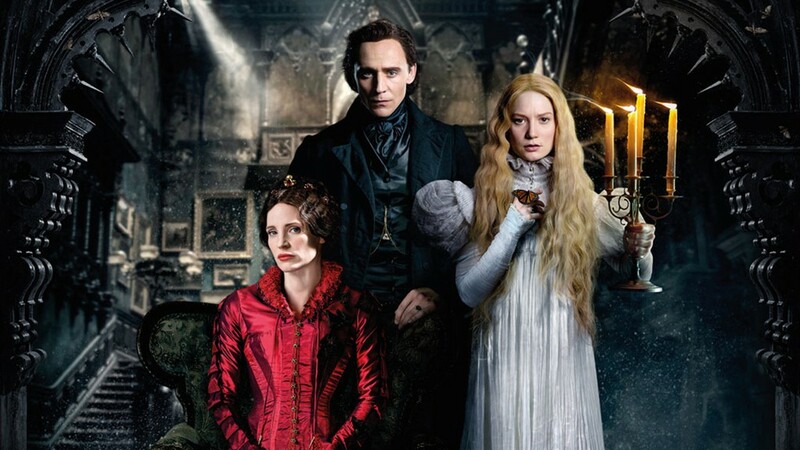 All involved with the production learned that del Toro has an encyclopedic knowledge of the Victorian Era. To build on the classic visuals, set decorator Vieau sparred with the director on each element of the décor. The filmmaker wanted “Bradbury & Bradbury wallpaper.” Vieau would go on the hunt for it. He was able to source period furniture and décor without having to go to England, as was originally planned. In L.A., he found a 17th-century tapestry that was used in Allerdale Hall, a piece that really anchored the opulence of the great mansion. But the discussion really began with color and texture; “color was the most important thing in the film for me,” says Vieau. The filmmaker loves teal greens inspired by foliage; his color choices create mood, setting—a mystical world of his imagination. Much of Lucille’s wardrobe was about “blending into the architecture and that was the footprint for how we approached color,” says Vieau. The Sharpe master bedroom was filled with deep textured velvets, the drapes in rich silks. The great hall was decorated with cotton ribbons on the bookcases to add gold highlights; the sofa was draped in deep green silk; the furniture was reupholstered in tapestries. Fittingly, the word “Fear” was layered into the house, throughout the design elements. The wallpapers were custom designed to incorporate the moth and butterfly motifs that del Toro wanted repeated in the floors and hallways—symbolizing Lucille’s fascination with trapping things, people, designing fear into the fabric of the house. “Fear” was inscribed into the chair, in the mantle—subliminally brewing dread, anxiety and terror, as any authentic haunted house should. In the early stages of the design process Hawley recalls the discussions about mood and color: the wardrobes in America represent summer, gold and tobacco, growth and progress; while England is winter, withering foliage, deep blues and teal greens. To add to the challenge, she was to avoid white, black and red for the Buffalo wardrobes—forcing her to work with a palette of cream, charcoal and burnt orange. There are no true highlights or shadows in those scenes, she notes; whereas, in Allerdale, the heavy dark fabrics weighted the characters in the depth of the Gothic romance. Hawley’s team became so attached to each creation they began naming the costumes. She sums: “All of the dresses have their moods.” The “Buffalo Bookworm” is Edith’s “Mary Shelly-romanticized-writer” ensemble, which is masculine in the tailoring. The “Heartbreak Dress,” based on a Klimt painting, is a delicate and fragile gown with a small flower with a heart in the center. “It was how we found our language in terms of decoration, adding to support the story,” says Hawley. Flowers were a theme in Edith’s costumes conveying “richness and fertility… her generosity in spirit.” Her bride’s dress was decorated with a string of violets, a Victorian symbol of memory and morning. Lucille’s dresses were barren with motifs of withered leaves that were full of catastrophe, starvation and barrenness. The embroidery on Lucille’s wardrobe mirrored the details in the architecture of the house. “So she was wearing the house in many ways,” says del Toro. The tailoring of her wardrobe was decidedly different as well. Hawley’s designs accentuated Lucille’s thinness; the dresses were very fitted and slim “so you could feel the bones through the clothes.” Her frail silhouette resembled the long, narrow shapes of the house. The costume department worked closely with del Toro to explore and help each of the actors to identify the demands of each character. The director wanted the costumes to play with scale and shape, so the choice of textiles was informed by his ideas. “We wanted to echo the architecture,” says Hawley, “so we tried to make the clothes very sculptural.” When Edith begins to fade at Allerdale, she becomes frail “more transparent, like a chrysalis” and that idea translates to her nightdress. The layered delicate silks of the costume were intended to aid Wasikowska’s performance in its movement. For their part, Lucille and Thomas were like chameleons in their world. Against the blues and shadows of the house Lucille blended into the walls like a moth. To further accentuate the director’s motif, the wardrobe team spent hours hand-stitching fine fabrics by using antiquated pleating techniques; this made the outfits flow and flutter like the wings of del Toro’s favorite insects.